Organic Fair-Trade Raw Shea butter – This is God’s perfect creation at its best! Shea Butter is fabulous for your skin. From healing benefits, therapeutic benefits, visual benefits to moisturizing benefits, Shea butter is our ‘go to’ ingredient. Our Shea is extracted from the Karite (Shea) Nut in Ghana using traditional West African methods that do not utilize chemicals during processing. Because this Shea butter is unrefined, it retains the highest concentration of healing and moisturizing benefits for our skin care formulations. Shea Butter is a natural source of vitamins A, E, and F. These antioxidants help the skin to retain its natural elasticity, absorb moisture from the air, and may help prevent premature wrinkles by boosting collagen production (Oh Yea!). 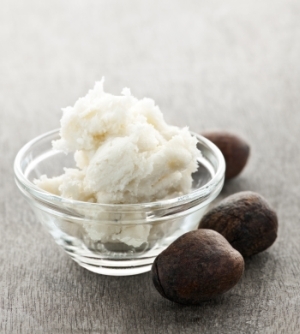 Shea Butter also purifies troubled skin like eczema, psoriasis and even stretch marks. *Get on Shea, Get on Pureganix! This entry was tagged Cosmetics, Ghana, Karite, Moisturizer, Natural, organic skin care, Pure, Shea, Shea Butter, Stretch marks, West Africa. Bookmark the permalink. Shea butter is so good for your skin. Kristin, It is absolutely amazing!